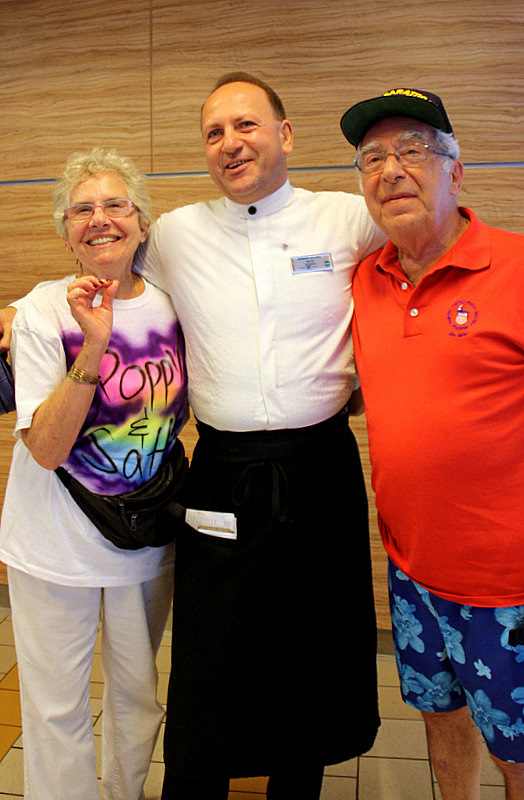 In our first article about Celebrity Cruise’s Silhouette, we intentionally did not write about the extraordinary level of crew service we experienced – because we wanted to give it special attention. 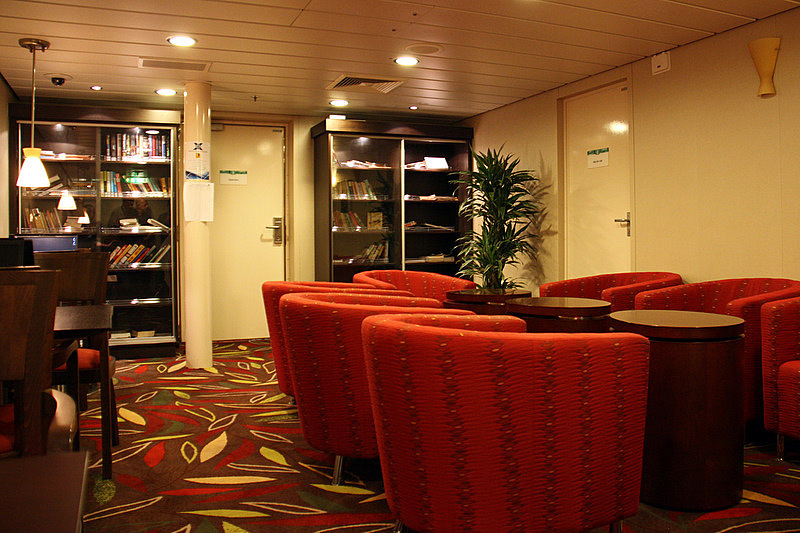 The service aboard the Silhouette was so exceptional that we decided to do a little research into the reasons. 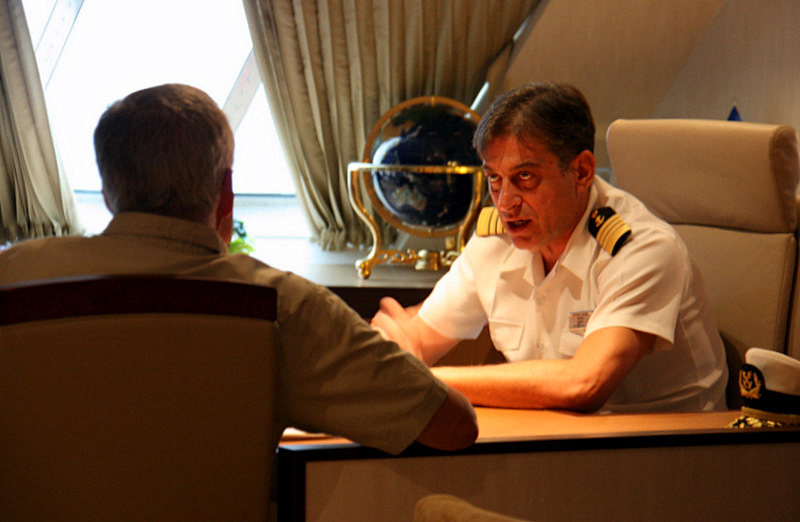 We have interviewed many ship’s captains. The master of the Silhouette was one of those that immediately makes you feel comfortable and leaves you with the certainty that you are in the hands of an extremely professional and capable veteran of the sea. 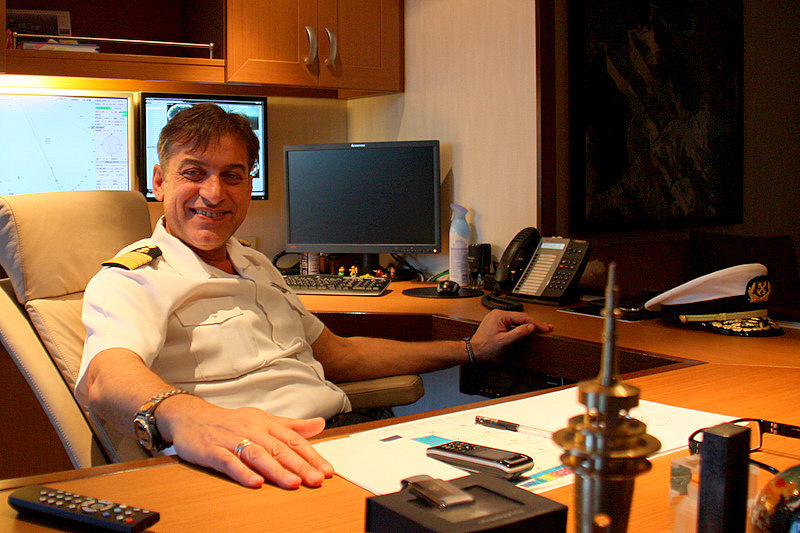 Like many of his peers, Captain Pagonis has a maritime family history, which led to his interest in applying for the Marine Academy in Athens in 1981. After graduating in 1984, he spent two years in the Greek Special Forces before returning to the sea. He received his Master’s License in 1998 and his first command in 2003. 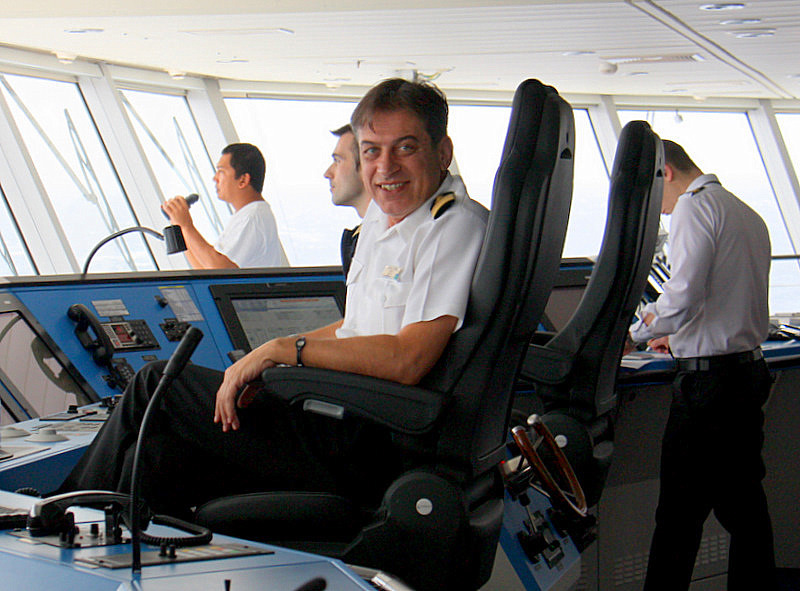 Married with three children, the captain resides in Belgium and Greece. He has intellectual interests in European and Roman history, and gardening – especially gardening! 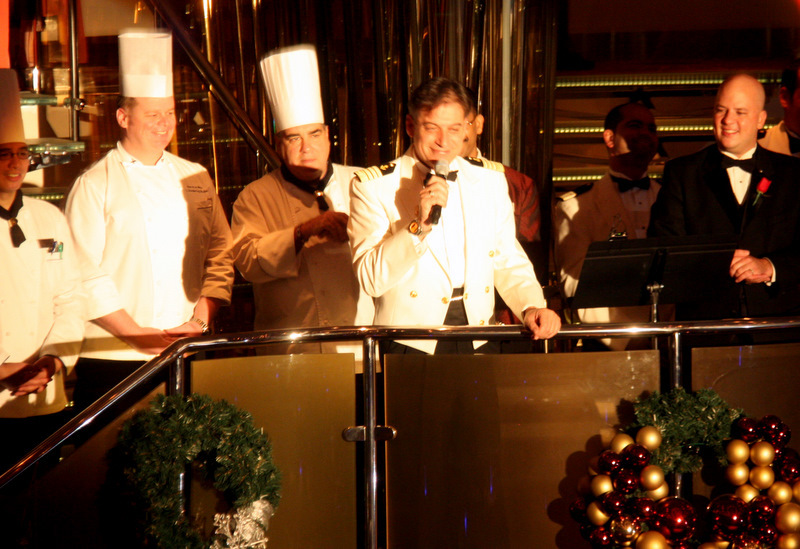 We always ask each Captain what is his favorite aspect of being a Master of a cruise ship. The answers are often similar. In addition to their primary duty to provide a safe and enjoyable vacation to all passengers, most Captains relish the hands on stimulation of maneuvering and docking these colossal leviathans. These are obviously congenial men of vision with a keen appreciation for the enormous. Captain Pagonis is an individual you would enjoy having as a neighbor. His enthusiasm for his work and the sea is contagious. We could have listened to him talk all day, but he is indeed a busy man. 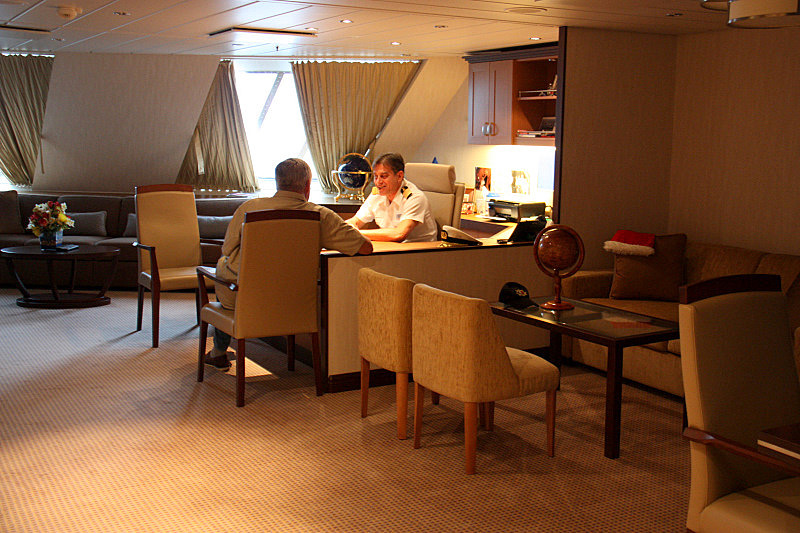 Our next interview was with another important ship’s officer. On Celebrity cruise ships, the Hotel Director is the ranking officer directly responsible for passenger comfort and satisfaction. On our Silhouette journey, the job was well fitted to Sue Richardson a veteran of 23-years of remarkable service to very discriminating guests. 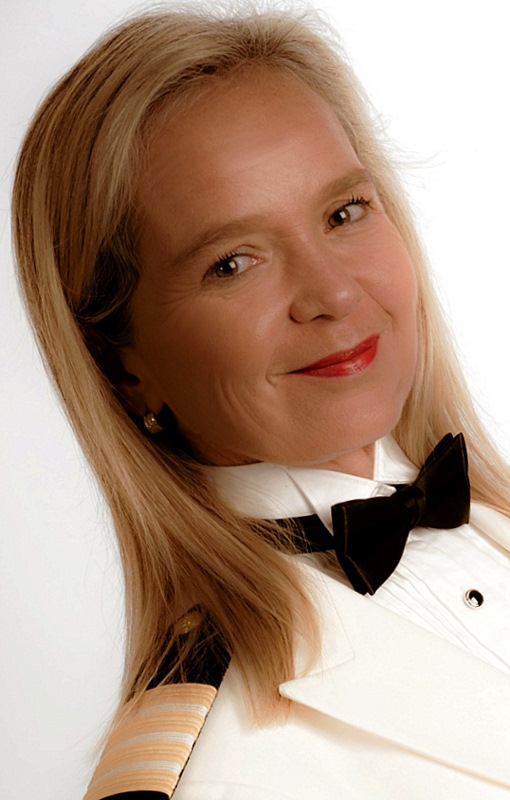 During her career, Sue has been responsible for managing hotels, the hospitality function of several ships, and even a private island in the Bahamas. Onboard the Silhouette, Sue has ten department heads reporting to her. 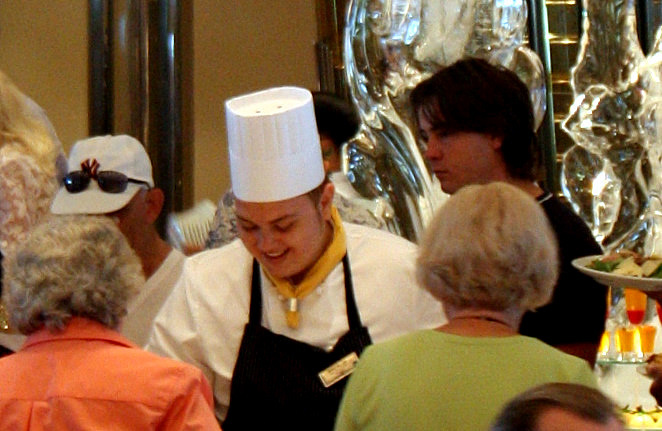 Her departments make up the majority of the crew and all the folks responsible for making your sea voyage a vacation to remember. 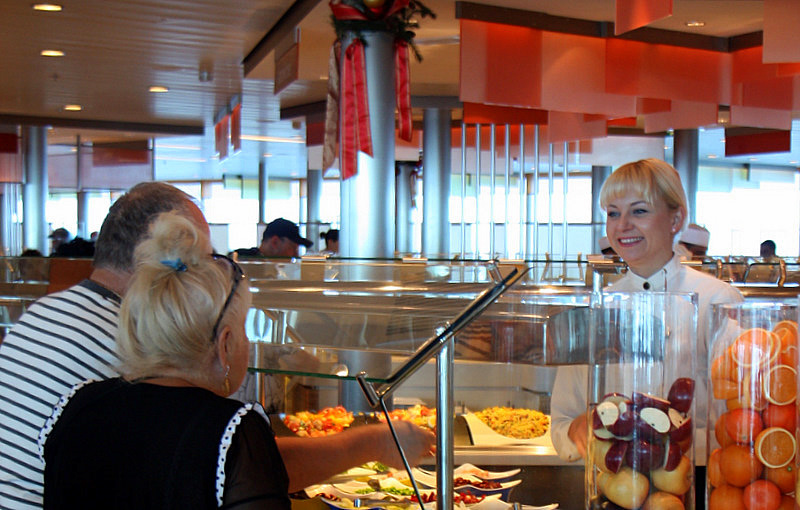 Among her duties, Sue is responsible for the food, beverage, dining, entertainment, and cabin services – need we say more? It is not obvious to passengers, but all members of a cruise ship’s company work under a time-definite contract of employment. 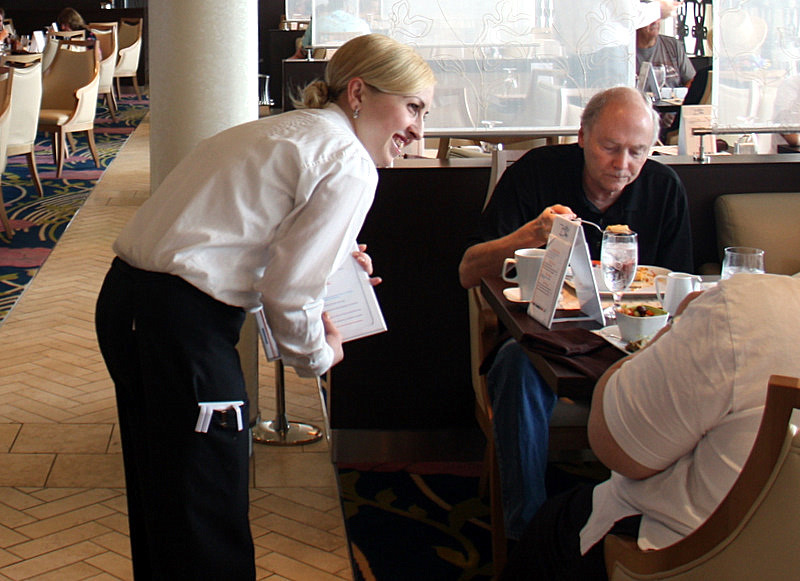 For example, restaurant servers or room stewards might contract to work for six or eight months at sea with two months off. Due to the nature of these maritime contracts, ship employees are coming and going all the time. We asked Sue how it was possible to keep the high team spirit that was so evident aboard the Silhouette. Sue said that when nurtured, the ship’s company gels and things start to hum. Over time, each new employee enters the crew and senses the already existing can-do attitude of his or her peer group. They blend in quickly and service remains excellent. It is obviously a winning formula, Sue! We wondered what was involved in keeping sea-going employees “happy.” We were invited to tour the crew’s quarters on the Silhouette, and came away most impressed. We were not able to photograph individual living spaces, but can report that they are quite comfortable. The old days of crowded and impersonal sleeping rooms are gone. One or two people to a cabin is the norm, not the exception. 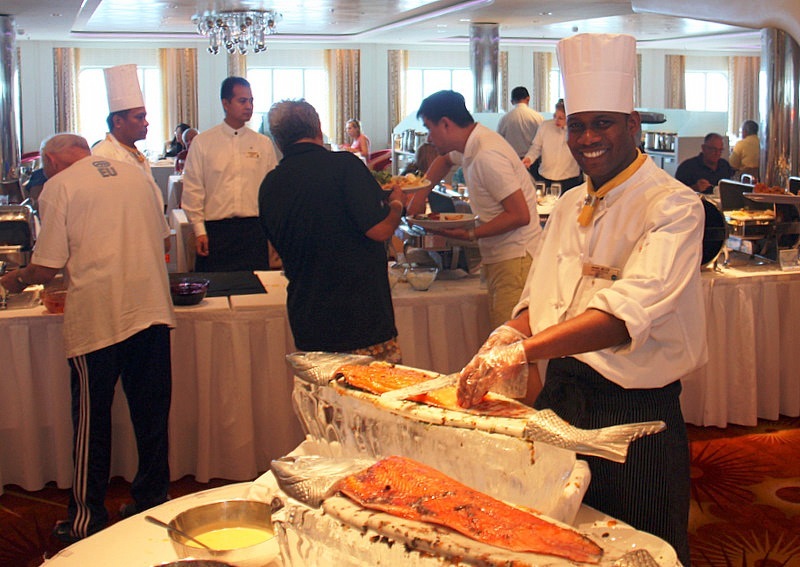 We were delighted to learn that the crew eats the same food as the passengers and in their own private dining room. 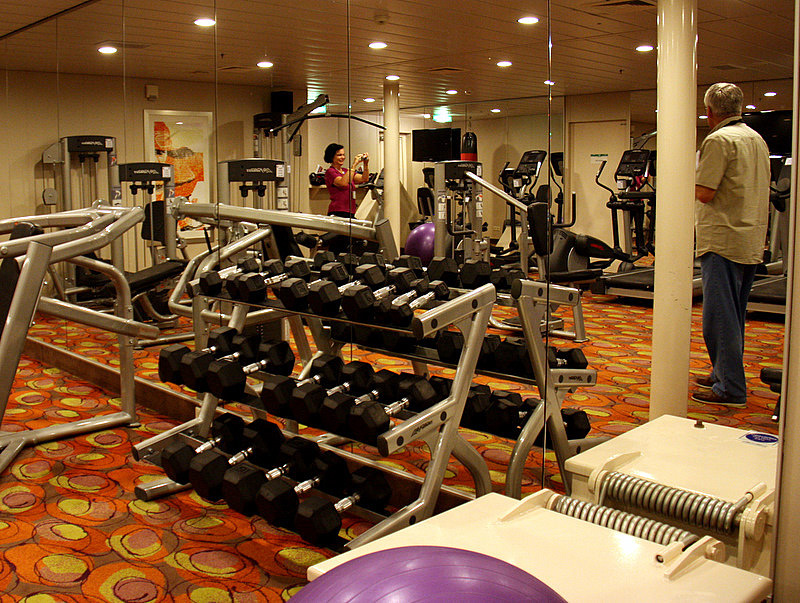 They relax in comfortable staff lounges, and exercise in well-equipped gyms. 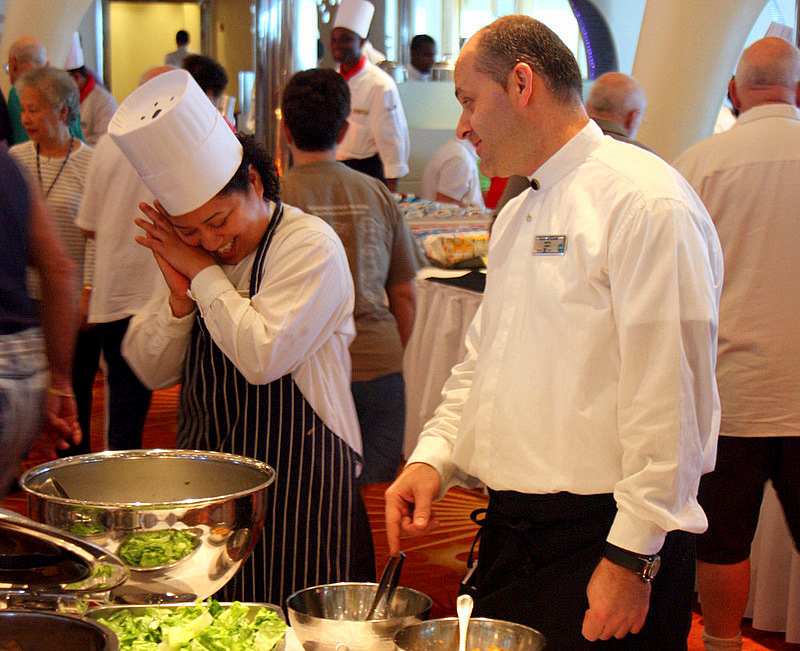 Being a member of the crew of a contemporary cruise ship is still hard work, but the living conditions are more than adequate – and very different from the stories of old. We have found many cruise vacationers to be under the impression that the Captain responsible for their specific cruise and safety is like Captain Merrill Stubing of the Love Boat. They expect to find him at the helm the next time they decide to sail on the same ship. The reality is that Masters move from ship to ship on a routine basis. 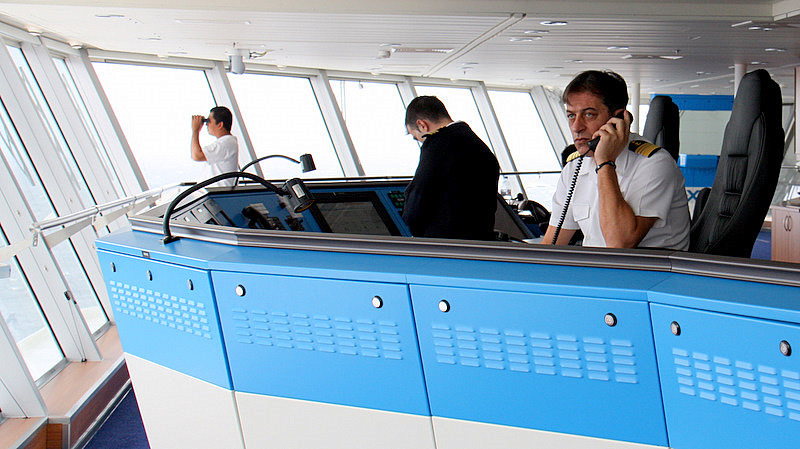 A captain’s contract is likely to include three or four months at sea, with equal time-off. By default, that requires an ongoing change of Captains. Contract times vary, but this practice of rotation is also true of the other ship’s officers and crew. In order to make such an inherently mobile system work effectively, standards, practices, rules, and protocols, must be stringently adhered to throughout the industry. Be sure to read our opening article about the Silhouette at http://is.gd/wgvfVi and see our photo gallery of the ship *here*. 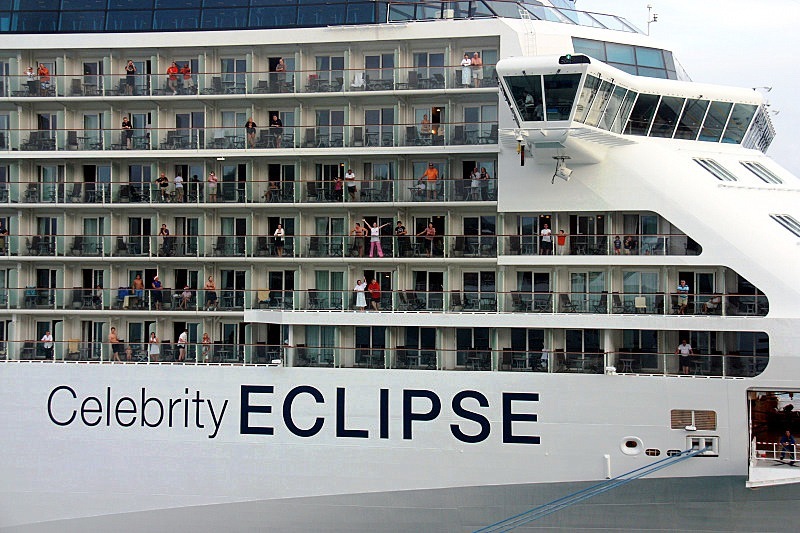 The Silhouette will be sailing the Eastern Caribbean from December 2013 until April 2014 out of Ft. Lauderdale. This entry was posted in Celebrity and tagged Best Crews, Best Cruise Lines, Best Cruise Vacations, Captain Nicholas Pagonis, Celebrity Cruises, Relection, Silhouette. Bookmark the permalink.